Innovative accuracy products for the competitive shooter. Ø Original research paper proving the advantage of rimfire concentricity sorting. Ø Independent articles and reviews of rimfire concentricity sorting. 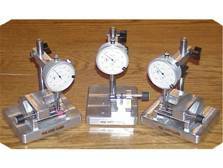 Ø Product bulletins for original Olympic Model and New Club Model gauges. Ø A high precision concentricity gauge designed to accurately measure runout and critical case dimensions of centerfire ammunition. Ø Locking Mould Holders – keeps uniform pressure on your mould blocks. Spring loaded head design brings mould halves together straight every time.